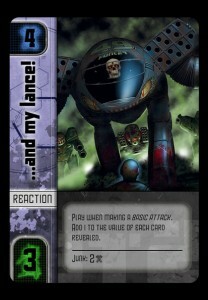 The BattleTech DMG: Really? Well, okay then. Based on the feedback I’ve received over the past 48 hours, I think it may be time to move the BattleTech Deckbuilding ‘Mechfighting Game from graphic design project to actual game design project. Like every third member of BoardGameGeek, I fancy myself a game designer — I even have a designer page on the Geek based on my 24 Hour RPG stuff — and, as part of the DMG graphic design project, I somewhat designed the game. So why not take that to the next level? Especially with people threatening to pick me up and carry me to the Catalyst Game Labs booth at GenCon? So here we go with a fast turnaround: By the end of the week, develop a proof of concept game. Not an actual prototype, but a gamelike object that shows how an actual game might wind up like. So far, my Sunday evening was spent creating additional cards for the game, some basics on what to include in an actual game, and a first go through of a card list. Gameplay is going to be the same as in the initial post from last week. You have a ‘Mech with armor; you have a deck that allows you to attack your opponent’s ‘Mech, equip your own, and maneuver through the battlefield. The big difficulty is deciding on the green attack values and balancing them with purchase cost and card abilities. So even if this doesn’t play well (and what game played well during the first playtest anyway? ), it will illustrate how the game works. More updates as the week goes on. Sweet! I really wanna see this at Gen Con.